The real magic of MURAL begins when you invite your teammates and all collaborate together in murals. 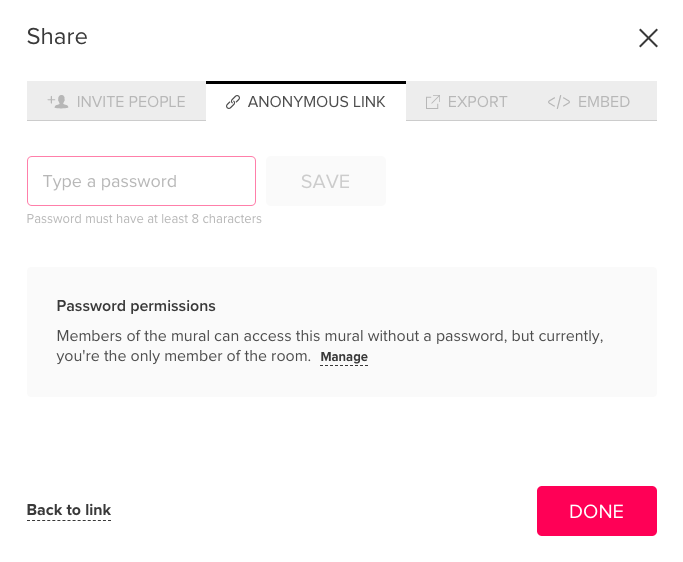 In this article, we'll give you an overview of where to go in MURAL to invite collaborators, the different permissions you can assign to invitees, password protections, and the different ways you can invite them. 1. Click on the pink SHARE button in the top right corner of your mural. Invite people: People will automatically join as members of your workspace. Adjust their permissions to 'edit' or 'view'. 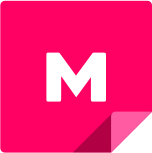 Anonymous Link: Use this to invite non-members to collaborate quickly and securely. Export: Get a shareable PDF or PNG of your mural for offline use. 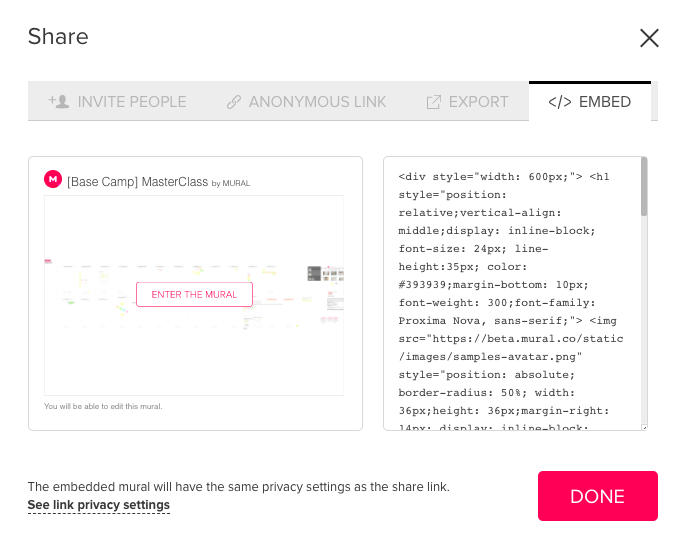 Embed: Generate and copy a code to paste into an external website. View-only users will not see any of the buttons on the top or left-side toolbar. Get a quick link to invite members to your mural (and thusly, workspace). 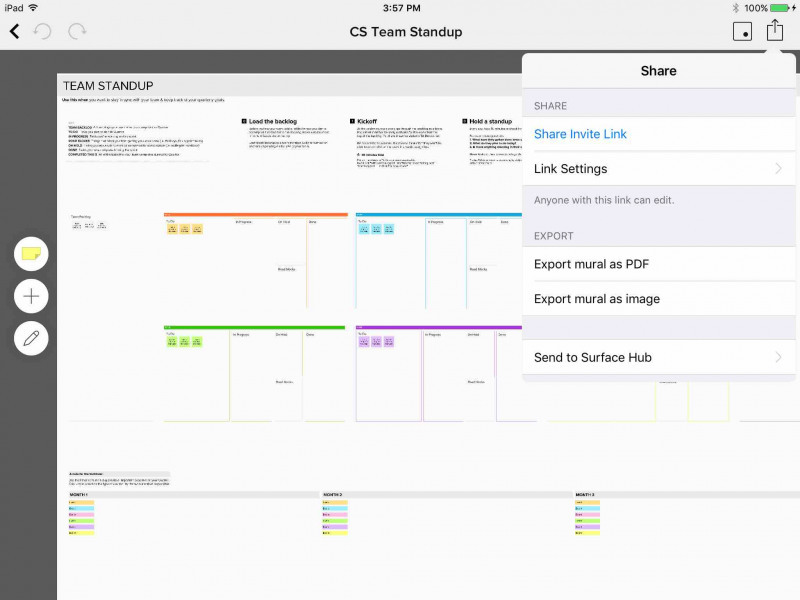 Generate a share link in the modal window. Copy the link and send it to your collaborators. 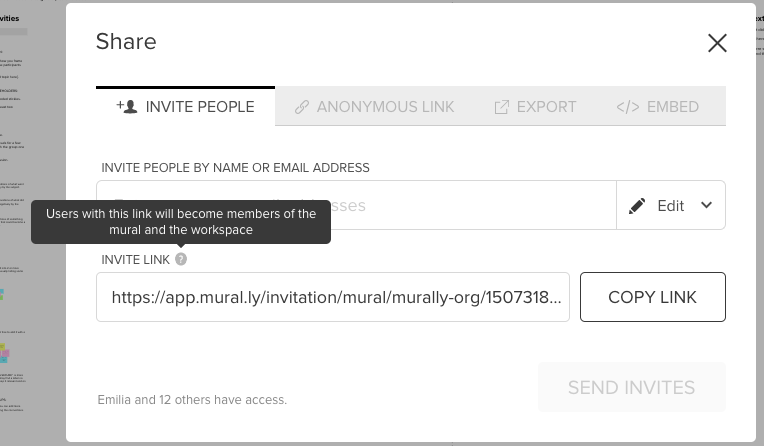 Generate automatic email invitations to join your mural. Type your team members' email addresses in the bar above the link.If your workspace has guests enabled, people outside of your workspace domain will be invited in as guests. Hit 'enter' to add them to the list. Your collaborators will receive an email with an invitation to join your mural. If they click on the emailed link, they will be taken directly to the mural (they should be signed in first!). To keep your mural extra private, you protect it with a password. You can do this under the 'Anonymous Link' tab. Under the EMBED tab you can generate an embed link to embed a thumbnail of the mural in a website. Shown here on an iPad. Now you're ready to unlock the power of MURAL and collaboratively create cool stuff!